I just donated blood yesterday! I cant believe it. 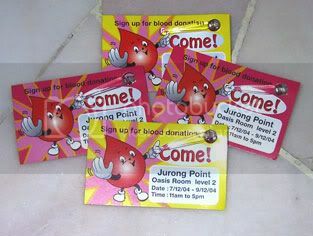 I was just on my way to Jurong Point to pay the bills, minding my own business and before I even stepped in the building, there was a girl who came up to be and asked me if I would be interested in donating blood. She was very enthusiastic and bouncy. Told me that she was from Singapore Poly and was doing a blood drive. So I listened to her for a bit and I thought to myself, what the heck. Why not? I’ve always been curious to know what the proceedings of blood donating anyway. So I followed her to the Oasis room where the set up for the blood donation was. The first thing I noticed was that there were quite a number of people there. To my front, there was the surveyors and the doctors and to my left there were many benches set up with stands beside them. Quite a number of them filled with people of all sorts of sizes, sitting quietly while the nurses attended to them. Some of them looked nervous, some queasy even. So I agreed and said a little prayer and filled up the questionnaire, submitted my identity card to one of the surveyors and then proceeded to the doctor after they keyed in my information. Later on, I went to the blood tester and had my middle fingertip pricked. Sharp stinging pain, but it was bearable. The lady quipped that this was the most painful part while I look in surprise. “You mean, that the blood donation doesn’t hurt like this? I found it hard to believe!” She smiled at me and gave a nodding affirmation while taking the blood sample from my finger and dropped it into a small black machine. I then proceeded to the last stop and sat on the rubbery seat while many nurses hovered around me. One to put a blanket over me, another to take my pressure, another to teach me about the procedures. “If you’re scared, look away” One nurse told me so I turned around and saw another guy who was donating and asked him “How’s it going?” He gave me a thumbs up. One nurse rubbed anaesthetic and I breathed in deeply and thought to myself just what on earth did I brought myself into. 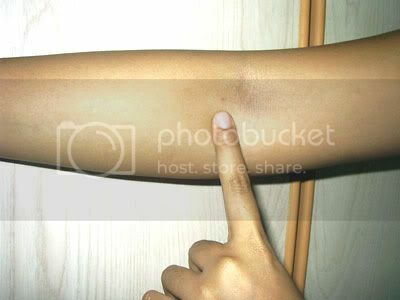 The nurse then pricked my right arm, just below the bending part. There, she said, now just squeeze the ball to regulate the flow and reduce the feeling of numbness. That’s it? It didn’t hurt that much after all! I then looked at the blood bag and felt such an amazement that I could actually do something crazy like donating blood on a whim like that. I stared at the crimson red blood and was just overwhelmed by the feeling of amazement. The girl from before came up to me again and asked me how did I feel? “Very accomplished” I replied and gave her the thumbs up too and I chatted with the friendly nurses there. Where my arm was pricked for blood. Not very noticeable right? Next PostNext Your can be pysically independant … but how about mentally?